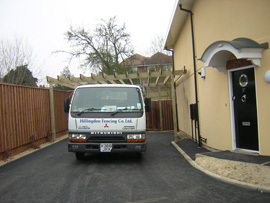 Hillingdon Fencing has been established since 1974 in the fencing industry. We carry out works for large construction organisations, local authorities, government bodies and domestic home owners. Hillingdon Fencing offers a free quotation service from experienced estimators that have been in the trade for over twenty years and also have experienced erectors that are C.S.C.S (Construction Skills Certification Scheme) certified in partnership with FISS (Fencing Industry Safety Scheme). We hold valid CIS certificates, fully insured, HSE Policy in place. When on site we can offer and supply quotes to your requirements and can offer advice on what would be best for your site requirements. Standard fencing can be offered and fencing to suite your requirement can also be offered and manufactured to suite the site conditions.